Fulton, NY – The 2012 edition of the Fulton Jazz Fest is set to bring cool jazz to the hot nights on the shores of Lake Neatahwanta behind the War Memorial in Fulton 5-11 p.m. on August 10 and 11. The Greater Oswego-Fulton Chamber of Commerce will present two evenings of great music, fantastic food and lots of fun. Admission is free to the two day event, which kicks off on Friday on the Eagle Beverage sponsored stage at 5 p.m. with Stroke, the award winning R & B band from Syracuse featuring Hall Of Fame artist Isreal Hagan. Grupo Pagán, a Latin-American band based in Syracuse, will finish the evening with their high energy intoxicating brew of sound, with influences including Santana, Shakira, Sade, and beyond, while adding original music to their set list. Saturday’s lineup up starts with vocalist Anna Vogel, giving a fresh life and sound to so many of the beautiful standards of the Great American Songbook at 5 p.m., followed by Nancy Kelly, always a favorite, with her sultry voice and engaging stage presence. Finishing the evening is Brass Inc., the high energy 9 piece horn band from Central New York. Plenty of free parking is available and the gates will open at 4:30 p.m. Local restaurants The Blue Moon Grill and Upperlandings will be on site to provide a variety of Cajun and American cuisine, as well as Kathy’s Cakes and Specialty Treats, who will be providing a variety of desserts to satisfy your sweet tooth. Alcohol will be available for purchase with proper valid identification. No coolers or pets will be allowed on site. Those attending are encouraged to bring chairs or blankets. 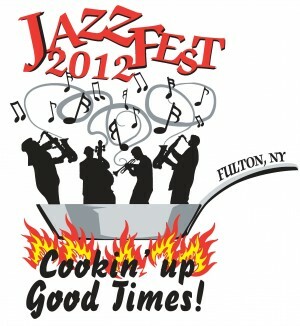 Sponsors for the 2012 Fulton Jazz Fest include Eagle Beverage Company, Fulton Savings Bank, Chirello Advertising, Oswego Health, Pathfinder Bank, Uniforms, Etc., Canalview Dental, Windstream Communications, Price Chopper, Canalview Travel Service, Caraccioli & Associates, Critical-Vac Filtration Corp., Davis Cleaning Service, Eastern Shore Associates, Foster Funeral Home, Inc. Great Lakes Horticulture, HELP! Small Business Solutions, James J. Campbell, MD PC, Linda Thomas-Caster & Sandra Farrands of RealtyUSA Fulton, Metlife Financial Services, Mimi’s Drive In Inc., and Oswego County Ambulance and Hearse Service. Media sponsors are The Valley News and YNN.